The warm weather has inspired me to uncover my grill and begin cooking outdoors. Unfortunately, this being the first day I’ve tested my grill (which was a little temperamental all last summer), I’ve discovered that it isn’t working properly. The chickens I was going to grill have been marinating all afternoon, in a mix of thyme, rosemary, parsley, lots of salt, pepper and olive oil. I’ve stuffed their cavities with some shallots and the branches of the thyme and rosemary. I only allowed myself an hour to make these chickens, so I had to do some fast last-minute strategizing . . . the fastest way to roast a chicken whole while still getting a nice mahogany brown exterior is to do what many professional chefs do–first sear it on the stovetop, then roast it in a 450-degree oven for about 45 minutes. 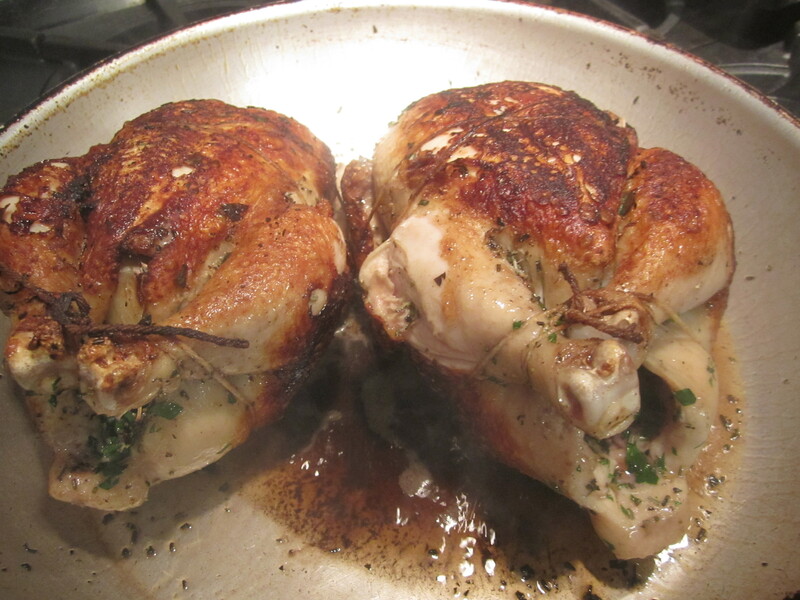 This is the way those kitchens always turn out roast chickens that are so brown and gorgeous. Searing on the stovetop is a smoky, messy proposition, but the results are worth it. Otherwise, it’s nearly impossible to get the exterior of a chicken this brown and crispy, while keeping the inside moist and juicy. 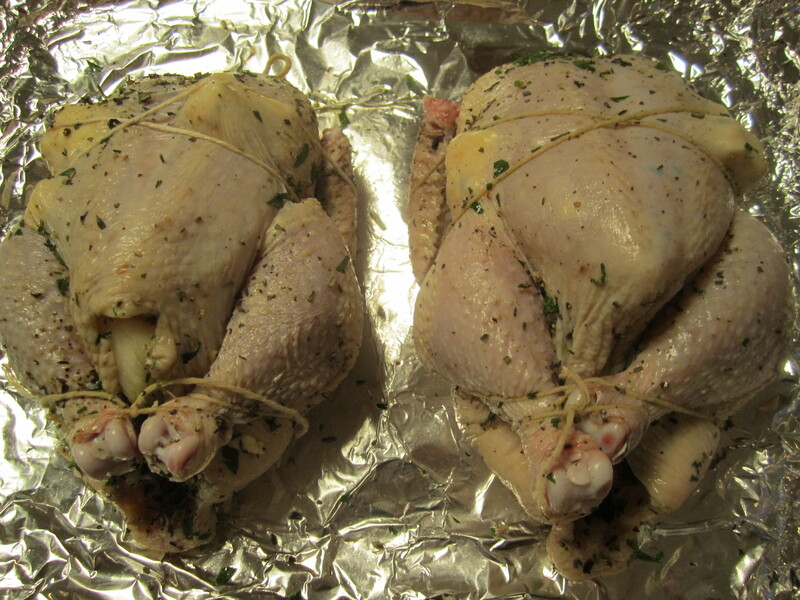 Before searing, the chickens must be properly trussed, so they hold together in a tight little ball. Trussing is not a difficult operation–simply take a length of kitchen string about a yard long and place crosswise under the middle of the chicken. Wrap the wings and pull them close, then cross over the breast, bringing both ends of the string down under the thighs. Wrap around each ankle and pull the string together tightly. Tie into a knot and cut excess string. I don’t always bother trussing the chicken when I’m going to make a simple roast chicken, but when I’m going to sear it on the stovetop first, the trussing is indispensable. It helps the chicken brown evenly all over and it allows you turn pick up and turn the chicken without ripping it apart. 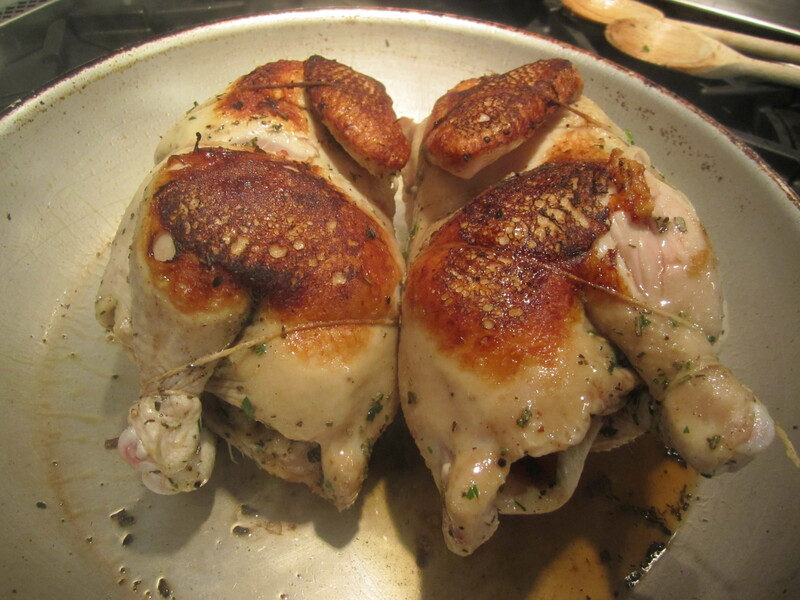 Begin cooking the chickens on their sides in an ovenproof skillet or a flameproof baking dish. 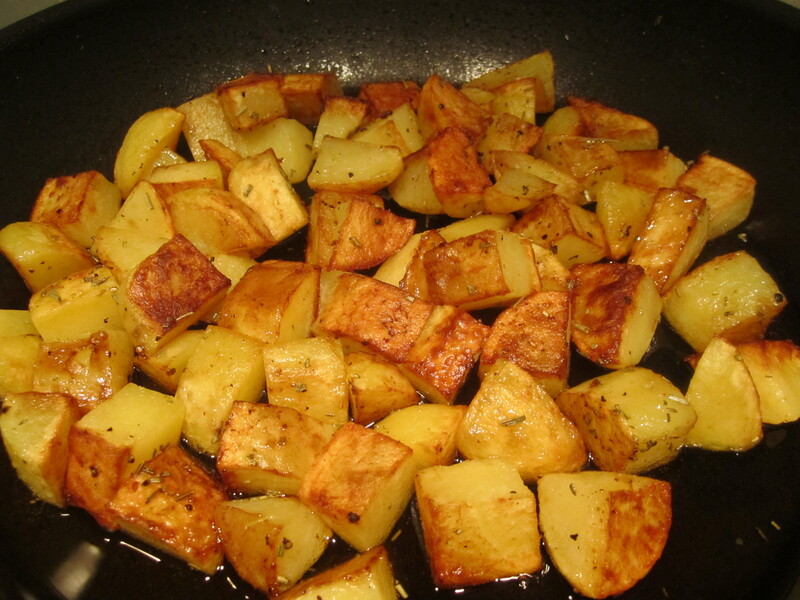 Place in hot oil and allow the sides to brown for about 3 – 4 minutes on high heat. Then turn them on the other side and brown. Follow with the bottom sides, then the breast side. 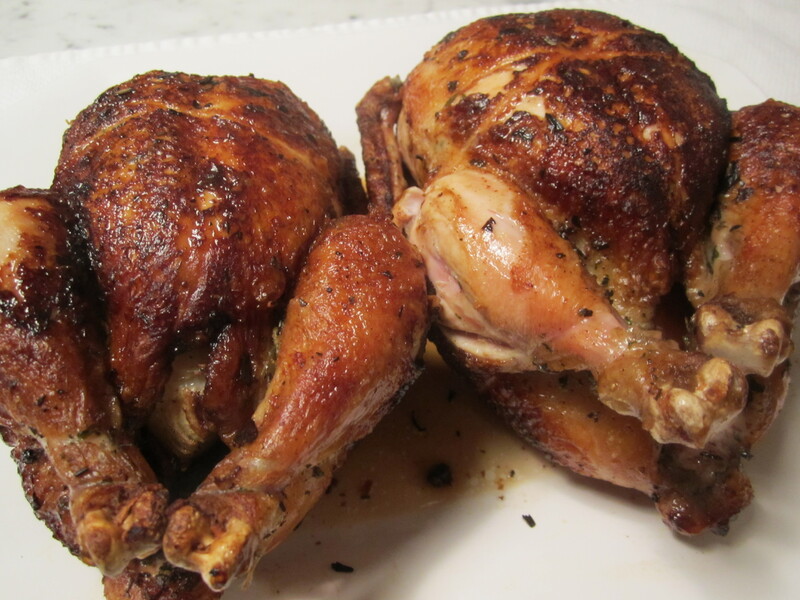 By the time you are finished, you have chickens that are evenly brown on all 4 sides. Then drain the burned oil from the pan and replace with a couple tablespoons of fresh olive oil and place the pan in a pre-heated 450-degree oven for about 45 minutes, basting from time-to-time. Let rest for 10 minutes before carving. Your guests will be very impressed with the results. 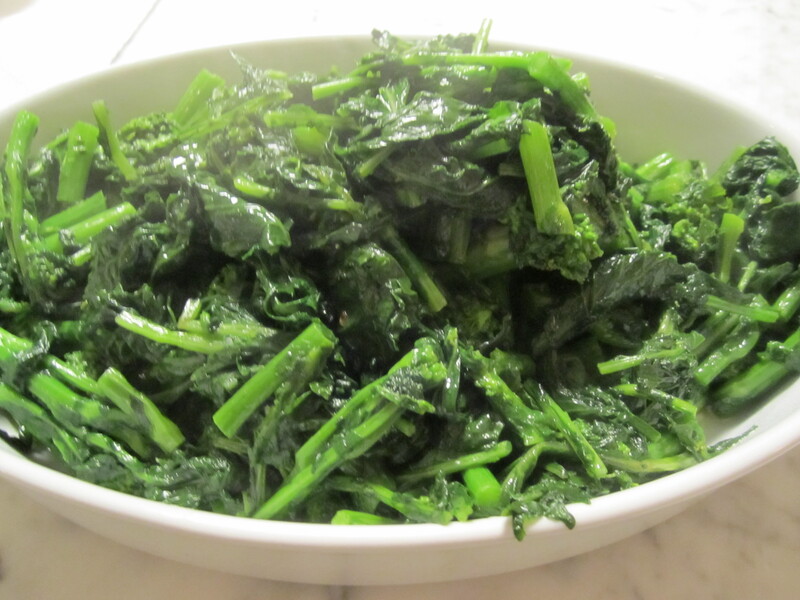 I’m serving my chicken with some sauteed broccoli di rapa, with garlic and chili flakes (see my prior post for the recipe), as well as skillet potatoes (you’ll also find that recipe in my earlier “dinner for one” post).